As a part of the doing well and doing good project, Youth UPF hosted An Evening with former Attorney General, the Rt. Hon. Baroness Scotland QC. Baroness Scotland has led an illustrious career in which she became a barrister in 1977 before going on to become the first black-female member of the Queen’s Privy Counsel in 1991. She was given a life-time peerage from Tony Blair in 1997 before becoming the first black female government minister in 1999. In government she went on to hold the prestigious post of Attorney General in 2007, becoming the first woman in history to do so. Despite these successes, she insisted in the interview that such achievements were never something she focused on in the work she did. She spoke of being driven to always do the best job she could possibly do every day. In order to combat all the challenges she faced throughout her career path, she highlighted the importance of recognising herself as a unique individual with an ability to make a contribution to the world that no one else could. Baroness Scotland said that the same applied to everyone present as well. It was not a desire to ‘be someone’ that led her to achieve what she did, but instead the desire to do good things. With this attitude, she could find an innate sense of happiness in being who she was, which enabled her ‘to set her own agenda’ for her life. In terms of her personal role-models, she spoke of the big impact her family had on her whilst she was growing up and how this continues to this day. Beyond her work in government and law, she has also been extensively involved in charity work which included setting up the Eliminate Domestic Violence Global Foundation(EDVGF). Her family upbringing inclined her to think that such a supportive and loving environment was the norm for most people. Upon the age of 21, she described a feeling like an ‘electric shock’ when she read her first divorce petition. Bad treatment of women was not in her experience or expectations. The fact that she could experience the opposite in the form of love, care and attention from her own family inclined her to want to pass the same experience on to those who had not had such an environment to grow up in. The audience was captivated by the shocking statistics which revealed the true extent and horror of domestic violence. The EDVGF now operates in a variety of countries and is aiming to spread awareness of its work to 1 billion people by the end of this year. In terms of the rewards she gains from doing such work, she explained that there is no greater satisfaction in knowing that you have made a change in someone’s life for the better. It was truly encouraging to hear such a point and a fantastic reminder to all young people embarking on their career paths that they can strike a good balance in achieving a lot whilst giving to other people. We are looking forward to the next ‘Evening With’ event and will release details shortly. At the bottom of this article there are links to the Youth UPF Facebook and Blog pages, as well as the Eliminate Domestic Violence Global Foundation website. 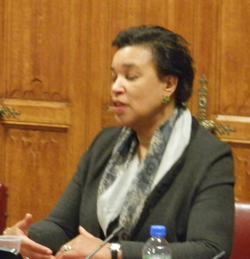 Please consult these pages for more information about Baroness Scotland’s work, as well as the work of Youth UPF. This has been the fifth in a series of empowering events aiming to motivate young people by connecting them with inspirational role models. 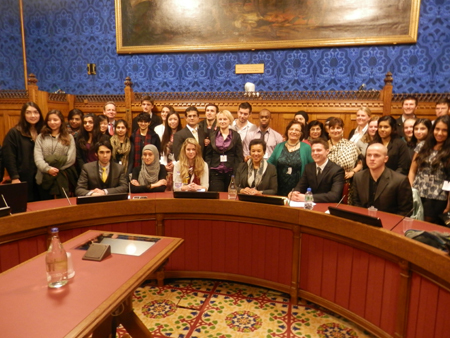 The event was well attended by fifty young people from a diverse range of academic and career backgrounds.